The Indian state of Kerala has been devastated by severe floods. More than 350 people have died, while more than a million have been evacuated to over 4,000 relief camps. Tens of thousands remain stranded. 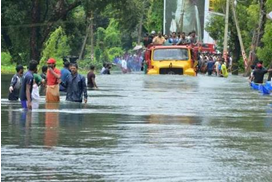 The floods have been described as “the worst in 100 years” by Kerala state’s chief minister. Similar descriptions are often used to try and define the magnitudes of a flood, such as a “one-in-100 year flood event,” despite it being widely recognised that such descriptions are ineffective for communicating flood risk. Our ways of thinking about probability and the risk of flooding, as well as measuring its magnitude, are in desperate need of updating. The 100-year flood, the flood that has a 1% chance of occurring in any given year, does not register in public consciousness. Let's pray to almighty to give strength to people of Kerala to overcome this disaster.